I let my XLCH sit for a long time and recently worked to get some bugs out of it & get it started. I had drained the gas tank before letting it sit but did not drain the bowl on my Bendix carburetor (it did not have a drain plug). When I tried to get the bike started, the accelerator pump would not push any gas through the jet. I removed the carb & soaked the bowl/jet in Berryman's B-9 chem dip for two days (my recollection is that I bought the chem dip in the mid-80s, so it is not the worthless reformulated carb cleaner). It did not remove the plug from the jet. This has happened to me before and I wrecked the jet then by trying to use thin wire to clear the jet. That left me with a useless jet. Has anyone else had this problem? If so, is there a solution to clear the jet? Does anyone know of a source to replace the jet (there is no Harley part number)? what is bad about the old aluminum carbs is bloom ( they call it bloom as in a flower opening up since the base metal oxidizes and swells shutting the port). NO carb cleaner will attack this, you need an acid base cleaner like aluma-brite, follow directions and as mr. doo suggested, heat is a good thing. sometimes though, the carb becomes a paper weight since the ports are permanently damaged. Your parts (aka the Bendix bowl) should look something like the below pic. Correct ? 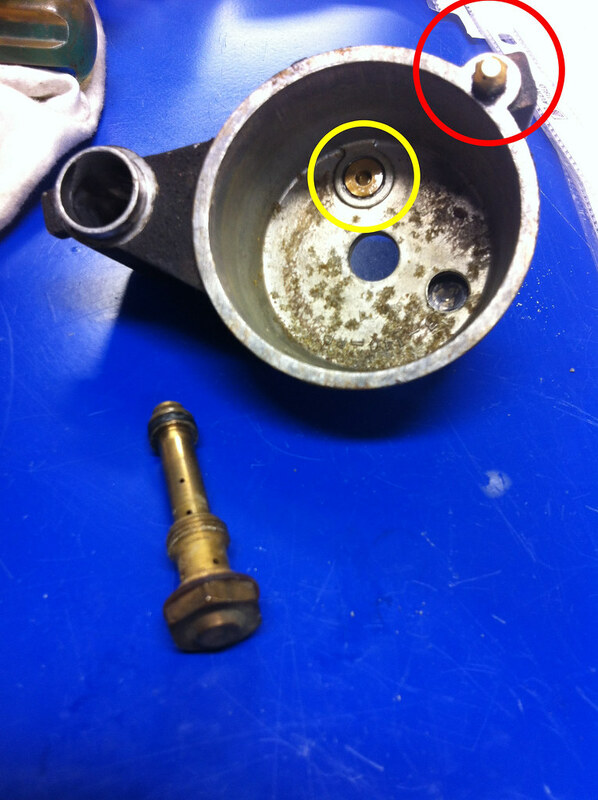 It might not be the nozzle (red circle) that is at fault but the check valve (yellow circle)..... or possibly BOTH. a blow test (aka mouth on the accelerator pump cavity & a finger blocking the nozzle) to verify the proper check valve operation. If the check valve is mal-functioning, air (air in this test, gas in real life) will feed back into the carb bowl vs going out the nozzle. Anyway, something you might look at. I’m willing to bet that the check ball has frozen shut the passage. The bloom corrosion may also respond to something as simple as lemon juice, but don’t leave it in there for too long at a time. The Doctor71 wins the kewpie doll! Tried applying 90 pounds of compressed air to the jet orifice. I couldn't get a good seal because the orifice is on a round surface, but the jet appears to be cleared. Thanks to everyone for your ideas! The Doctor71 got rep points for that.